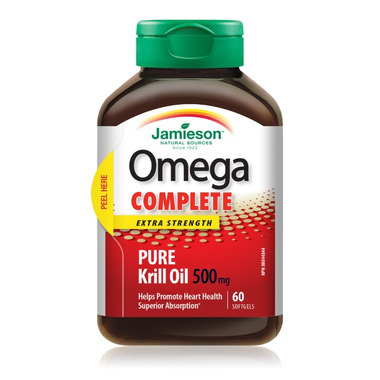 Formulated using only the world’s best and most sustainably sourced omega-3 oils, Jamieson Omega Complete sets the new standard when it comes to omega-3 nutrition. Omega Complete consistently offers minimally processed, naturally pure oils that deliver more absorption and superior health benefits compared to regular fish oil. Omega Complete Super Krill 500 mg is made from 100% Antarctic krill oil. Antarctic krill oil contains significant amounts of the omega-3 fatty acids EPA and DHA, in the form of phospholipids. This phospholipid form makes krill oil significantly more bioavailable than most other fish oils, in the triglyceride form, because it allows the EPA and DHA to be readily available for use by cells. Antarctic krill oil also contains the potent antioxidant, astaxanthin – making Omega Complete Super Krill an antioxidant source almost fifty times more effective than other Omega-3 products. Suggested Usage: Children 5 years and older: For the maintenance of good health, take 1 softgel daily. Adults and adolescents 9 years and older: Take 1-2 softgels daily.